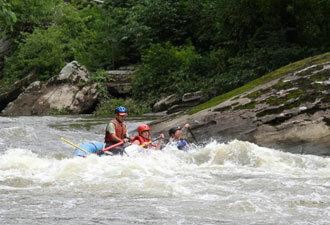 The Obed River's Class II to Class IV rapids provide thrills and challenges even for experienced paddlers. Nestled in the Cumberland Plateau of eastern Tennessee, the Obed Wild and Scenic River is a recreational enthusiast's paradise — a place where the great outdoors meets the expectations of the explorer in all of us. The river and its tributaries provide challenging whitewater paddling opportunities throughout much of the year. Kayakers can be seen careening down the river and over rapids with descriptive names that speak well of their thrilling potential. Widow Maker, Ohmigod!, and Wooten's Folly are just a few of the more colorful names. Paddlers make their pilgrimage to the river each spring, when rainfall brings a bevy of Class II to Class IV rapids to the 45 river miles of the park. There is nothing like the sounds that the rushing river brings, capped with screams and laughter from kayakers as they bounce up and down currents that resemble the sensations of a roller coaster. A more recent — and drier — group of adventure seekers tackles the rock climbing areas of the park. Virtually all year long, you can spot license plates from several states in these areas. More than 300 climbing routes provide challenge for anyone daring to scale them in the fastest-growing outdoor sport in America. The Obed features dozens of boulders to climb in a secluded area adjacent to the permanently-bolted routes. Every summer, the park hosts an annual Rock Climbing Expedition to teach beginning climbers how to scale some of the park's easier sandstone rock faces. These climbers test their nerve and nimbleness as they confront their fear of heights. The Obed challenges visitors like few parks can. 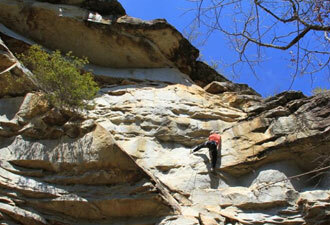 The Obed offers more than just the thrills of whitewater paddling and rock climbing, however. The park is also a calm place where visitors can take peaceful hikes and look for wildflowers, fish for smallmouth bass, and search for the more than 100 bird species found in the park. Nature enthusiasts can swim at places like Nemo and Jett bridges and camp at the Rock Creek Campground. Recreation knows no age limits — everyone can enjoy the scenery and picnic in the park. 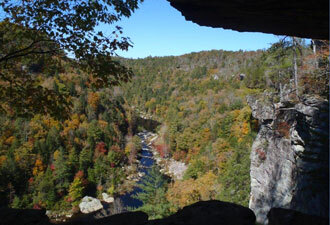 Visitors to the Obed Wild and Scenic River who love the outdoors are guaranteed to find some activity to interest them. The park became a part of the national park system in 1976 under the National Wild and Scenic Rivers Act. Since that time, recreationists have explored the park to see nature up close and to hear the sounds that the great outdoors provide. When you visit, you can leave here knowing that you've discovered a park where the forces of nature are always at your side, and where the opportunity to explore a beautiful section of wilderness will always be your partner.